In the map above, I’ve tried to point out most of the problematic sections around UW, excepting the significant additional troubles of ongoing construction. 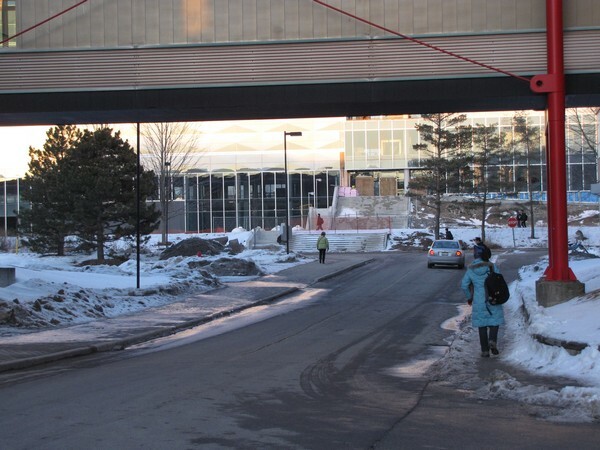 Below are a few photos I took this week that give a feel for the kinds of problems pedestrians face on the University of Waterloo’s main campus. 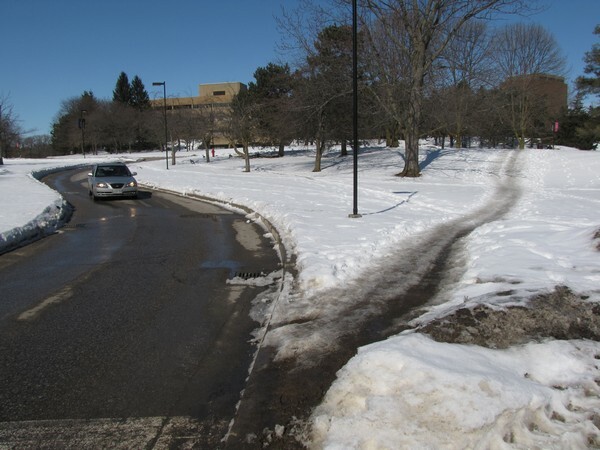 UW does have many portions that work fine for walking, but that is no excuse for its failures. Westmount Rd at University Ave. There are no sidewalks despite this being a direct path to the church colleges. University Avenue by Westmount. 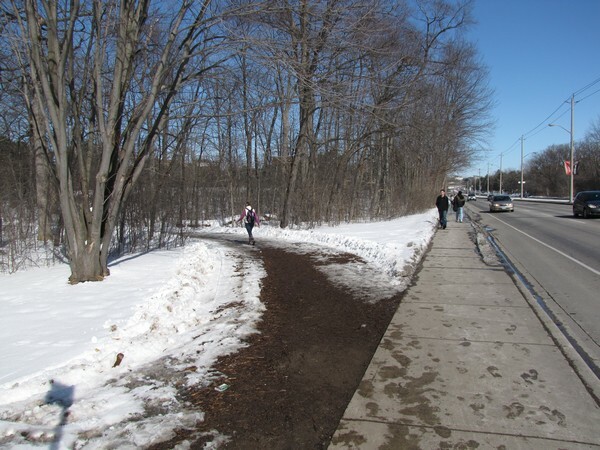 There is a muddy path towards Ring Road and a too-narrow sidewalk adjacent to the road. Buses are frequently found in that bike lane. Detouring a puddle on a University Avenue sidewalk. 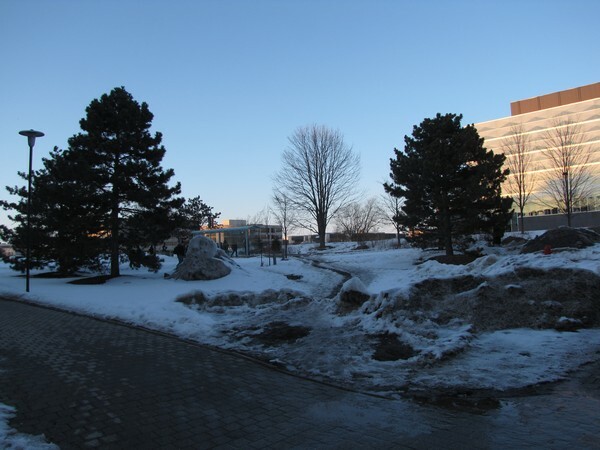 This well-used path between University Avenue and Ring Road crosses a steep hill and is often muddy and icy. 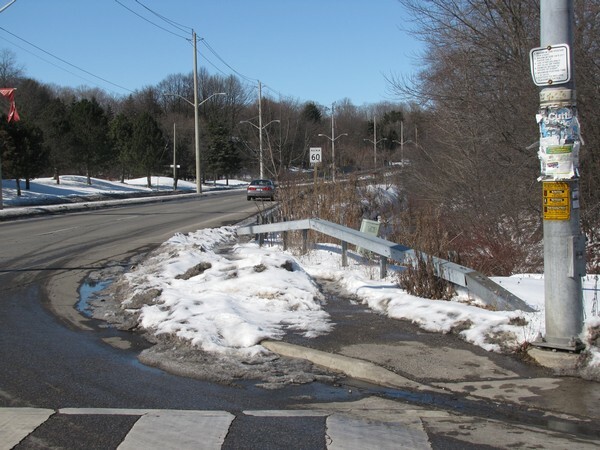 Alternatives either require a long detour or using this car-only exit road (not recommended). Ahead is the muddy way to one side of the largest student parking lot. 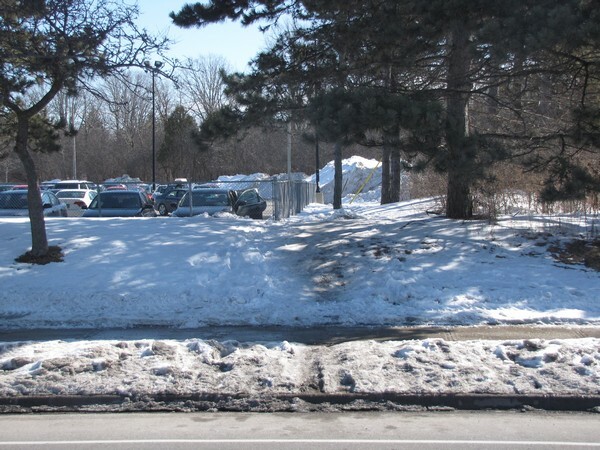 Instead of resolving this problem, UW exacerbates it with its fence along the side of the lot. Sometimes the snowbank at the end of the fence is many metres high, and it has probably led to many falls. 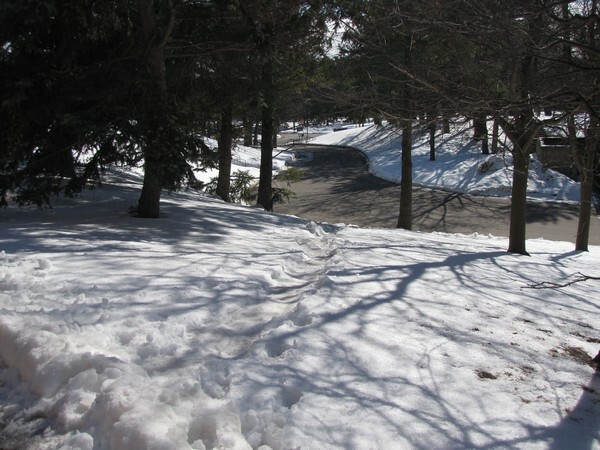 The other direction — the path from the parking lot to Hagey Hall. 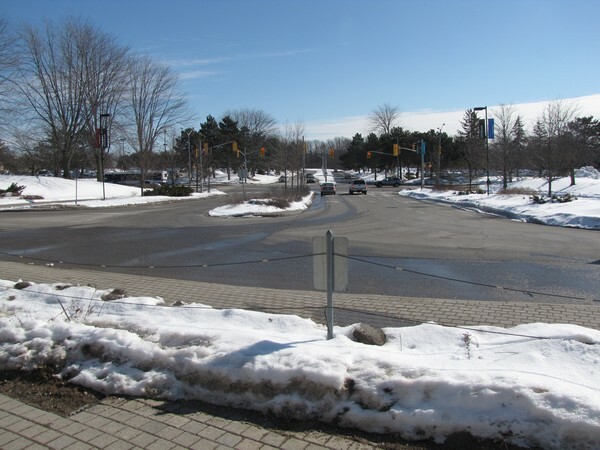 You cross both directions of University Avenue, that berm, a parking lot, Ring Road, and then go to your destination. This is the grand entrance to UW’s main campus, used by many transit riders and pedestrians. I don’t know the function of the barrier in the foreground, but making pedestrians feel welcome isn’t it. Seagram Drive past the intersection has no sidewalks. Ring Road by the Tatham Centre as viewed from the side without sidewalks. Here two access roads and the absence of a crosswalk make a downright pedestrian-hostile space (on the side with sidewalks). 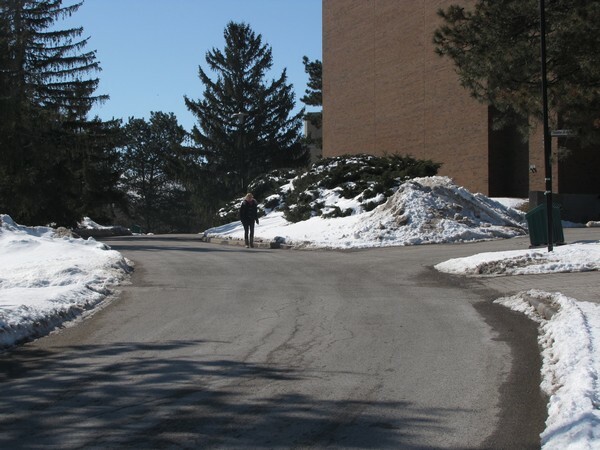 This is a main path to Hagey Hall and beyond, but cars rule here. This is a commonly used connection between paths by Hagey Hall and University Avenue (via the PAS access road). It’s steeper than it looks. Well, this is just grate. 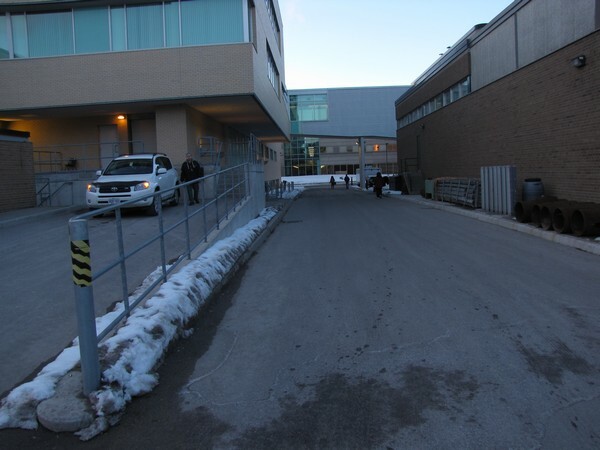 The interrupted pavement is on a path to the PAS building. Many stairs to choose from at the arts quad in front of the library, but usually the shoveled parts don’t go where you need to. This is a main path to the engineering lecture hall (RCH), but it is clear to pedestrians that it’s not their turf. Straight ahead is a path to one of the main UW bus stops at the Davis Centre. Mud and ice galore. Don’t miss the ‘great’ crossing of University Ave by the tracks, to say nothing of the plaza as a whole. As a University of Michigan alum, I would often hear from Michigan State University folks who would disparage U-M since it “lacked a real campus” and was “spread out across a city.” I would always retort that Michigan State’s “beautiful campus” was only designed to be seen from a car. Who wants to spend half a day walking to and from class? Give me a more urban, walkable campus any day. Great stuff, I remember my four years on campus, I kind of accepted most of this as a given. Seeing it here really reminds me of how nasty it can be. (That picture of westmount and university is darned dangerous, and I used it every day). One thing that always bugged me was snow shoveling. The sidewalks on university ave would never be shoveled in a timely way. 16-18 hours after snowfall was perfectly normal. It normally wasn’t shoveled on the weekends. 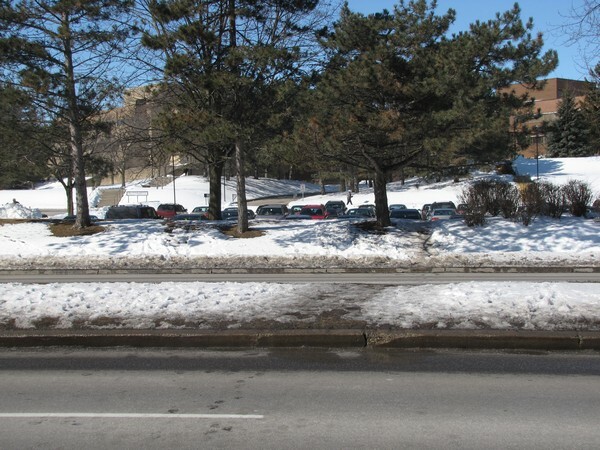 I lived close to campus, and used university ave every day, and was always ticked to be trudging through a foot of day old snow, walking next to a parkinglot that was cleared of snow hours after it fell. Cut through the parking lot? Good luck with that! The darned little hills made it an absolute pain! 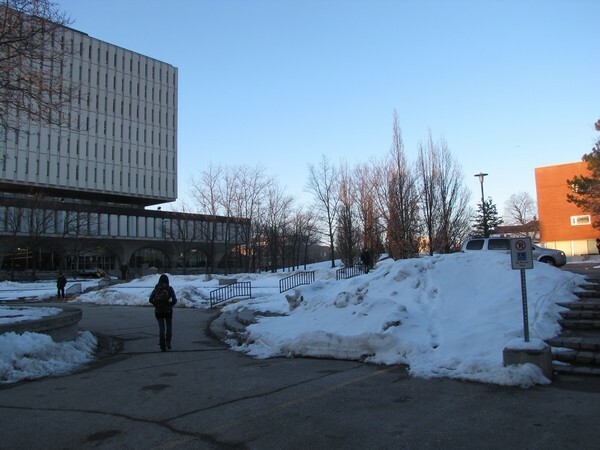 In Winter 2008, we received a major snowfall the Sunday prior to the March Break Open House. 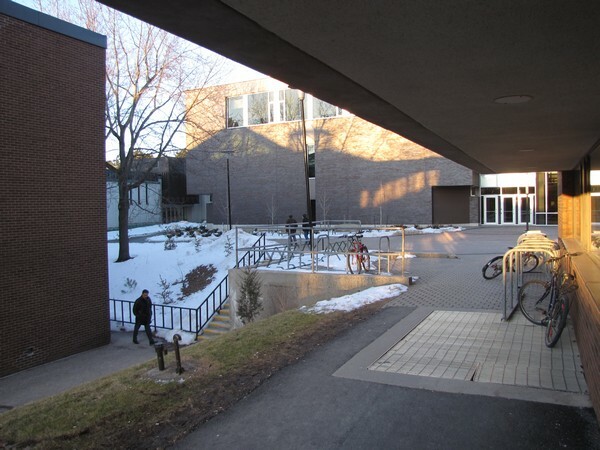 By Monday afternoon, there was a single foot-width path connecting the access road to Modern Languages and ENV Buildings and the interlocking brick path between those Buildings. At the time I was in a Health, Environment and Planning course and a guest lecturer (another prof) was giving us a quick introduction to accessibility planning. My group had on a pair of goggles that changed depth perception, and we stumbled through that part of campus. By 5 pm (a day and a half after most snow had fallen) the path wasn’t any bigger, so I took the initiative to kick free a larger path. By 6 pm, nothing had changed, so I grabbed a snow shovel from and went to get the job done myself, knowing there wasn’t going to be much done otherwise. The next morning, crews finally arrived to finish clearing a path at 11 AM, several hours into the day’s program, and not at all worried about how this would be viewed by prospective students and their families. 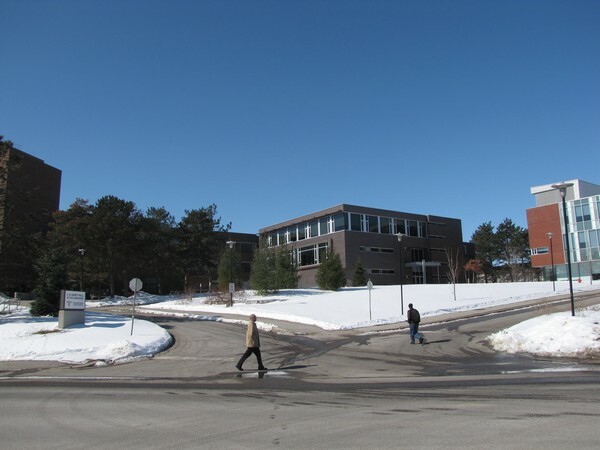 The Campus Master plan has provisions for, in conjunction with a way-finding system increased connectivity across campus. I pray that this means updating and resolving the hundreds of little problems with campus connectivity.